A photographer friend of mine got me this job assignment; a roadshow event organized by Takashimaya Shopping Center @ Ngee Ann City, titled Christmas Fantasy. As Christmas festive season closing in, they are selling children toys, stationeries, T-shirts and other merchandises. There are even 3 Meet and Greet sessions with special appearances of Angry Birds characters starting now until 10 December, Saturday. Well, it certainly draws a huge crowd, especially kids. Christmas Fantasy roadshow ends on 26 December, Monday. Make the jump for more info on this Barbie Girl. 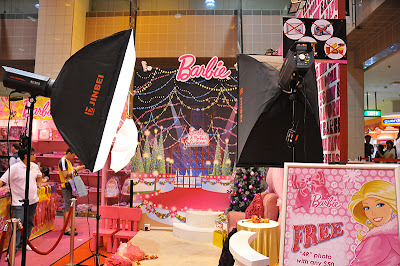 Barbie products are displayed at one of the atrium corners with a mini stage or studio set-up with 3 different backdrops side by side. The mother of this little girl and herself were the very first customers to register for the Barbie Girl glamour photo shoot. 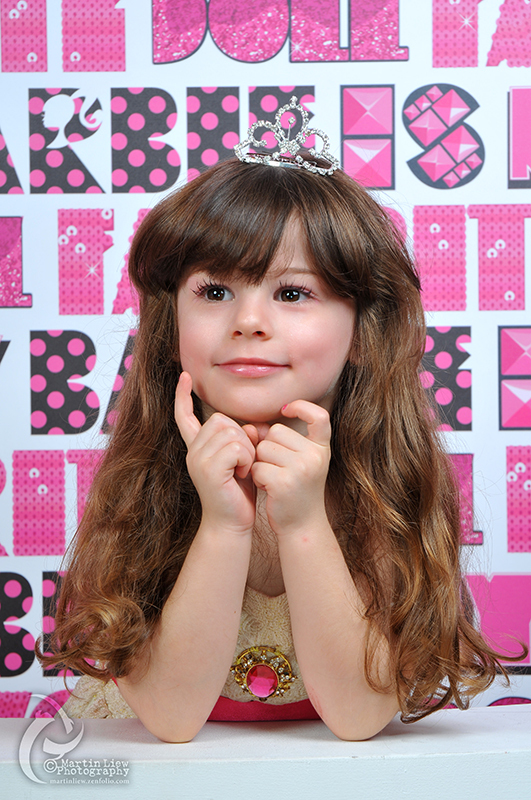 Parents get to choose from 3 different sets of Barbie dress for their little girls. There are Barbie dolls with the same dresses to go along, respectively. There are Make-up Artists doing make-up and dressing of clothing and wigs for the girls. I got to shoot 34 little Barbie Girls for a 6-hour shift work at the booth; non-stop without any break for nature's call or a meal. It was my first day. I took about 5 or 7 minutes on average to shoot a girl which is pretty fast (feedback from MUAs and my client or Boss). I took about 20 - 25 shots or more per girl. I'll take more shots if the little girl is photogenic and doesn't need me to direct them on posing. I will be working for the next 2 weekends; morning shift 10:00AM to 4:00PM Saturdays and night shift 4:00PM to 10:00PM Sundays. Here's the lighting set-up at the booth. OK here's a close-up image of the Barbie Girl. I just love those catchlights on her big round sparkling eyes with beautiful eye lashes. She put on a beautiful smile too. She looks more like the real Barbie Girl; a Princess. OK here's the strobist info to share with you readers. • 2 x Jin Bei EC-300 (250Ws) studio strobes; one on 32" shoot-thru umbrella on camera left and one strobe with soft box on camera right. Both set at half power. Strobes are triggered using Phottix Atlas transceivers. • Nikon SB900 on Orbis ringflash set at Manual mode 1/4 power, zoom at 35mm on remote flash mode. Orbis ringflash certainly brings out more shadow details and giving more softer light for such glamour shoot. The placement of the circular catchlights is perfect, forming a triangular formation with the other 2 catchlights. When I went back for work yesterday, the Barbie dealer expressed his likeness for all my shots especially those taken with the Orbis. Well, that certainly made my day. More Babie girl pictures can be viewed here. Pleasant viewing.